The first line of a post is always the hardest. And now that it’s over with I am happy. Now we can talk about how earlier today, when I was standing in my kitchen chopping sixteen ounces of dark chocolate, I kept thinking, “wow, I go through so much chocolate in one week. I should really have a chocolate sponsor”. I mean, Red’s got sponsors for all his snowboard gear, why shouldn’t I have sponsors for my most used ingredients. Yeah, I should, totally logical thinking, right? Right, right. But really, I go through way too much chocolate and it always seems like I am out every time I NEED it. Actually, I feel like that with most things. And by things, I mean food. Ingredients really. It seems I can never get enough of everything I need for the week in just one trip. I either forget to put something on my list, or (for whatever reason) don’t look at my list or simply forget my list entirely (yes, leave it at home). Yeah, yeah that’s me. Either that or I am not planned out well enough to know everything I will need for one WHOLE week (cause that’s a long time!). <–this is more likely the issue. I think the bottom line is that I would like to have a grocery store (and a very well stocked one with only the freshest produce, meat and dairy…what? Yeah, I am kind of snobby when it comes to food) as my walk in pantry. That would be such a blessing. What do you think? Can we make that happen? Prince Charming has lots of money doesn’t he? Where is my Prince Charming when I need him? These spicy sesame basil noodles are the final Chinese meal of the week. Enter giant sad face, but then enter a happy face because today is the Chinese New Year – and it’s Thursday! Ya hooo!! These noodles are kind of dreamy…oops, meant to say creamy, but dreamy totally works too. They’re lighting quick to make, think like Lightning McQueen (sorry, Cars was Asher’s favorite movie for quite a long while). Just twenty minutes and you are done. Yeah! And the flavors are so good. They’re spicy, a little tangy and full of that yummy toasted sesame flavor. I also added some basil AND some peanuts because one, I had both on hand, and two, I love them both so much. Plus, I sort of feel like every Chinese/Asian meal should be topped with either, peanuts, cashews, sesame or a combo. I love my toppings though… clearly. This recipe is just so easy that there is not a lot to say about it. Other than it’s delicious, carb filled and kind of cozy on these freezing colds nights we are all experiencing (it’s supposed to go down to -16 in Cleveland tonight!). Oh, and you can even take the leftovers to work the next day. Double meal baby!! 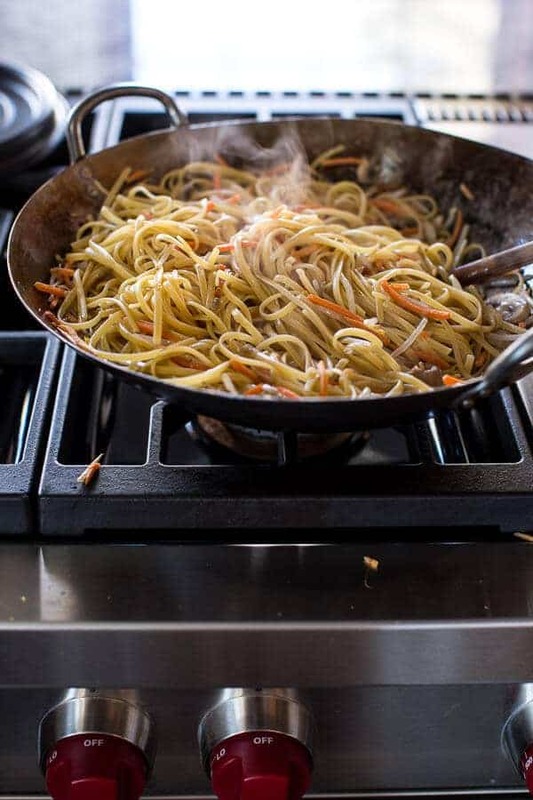 Plus, these noodles are like health food, and you can make them even healthier by using a whole grain or rice noodle. Nice!!! Oh and um, also? 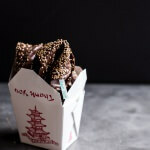 You should know that I went to great lengths to get those little Chinese takeout boxes. Think four different Chinese restaurants, on a Saturday, in a ski town that was so packed full of people it was probably over the limit for the number of people that can safely occupy the town limits. Anyway, they cost me fifty cents too, AND… I had the lovely pleasure of smelling like wonton soup for the rest of the day! All in the name of a good photo though…so it was worth it. And do not ask me why there are Coca Cola bottles in these photos. I just really do not know. 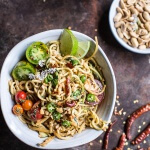 These noodles are kind of dreamy...oops, meant to say creamy, but dreamy totally works too. They're lighting quick to make, think like Lightning McQueen (sorry, Cars was Asher's favorite movie for quite a long while). Just twenty minutes and you are done. Yeah! Bring a large pot of salted water to a boil. Boil the pasta until al dente, drain and rinse with cold water to stop the cooking. In a bowl or glass measuring cup combine 2 tablespoons toasted sesame oil, the tahini, soy sauce, hot chili oil, balsamic vinegar and brown sugar. Heat a large skillet or wok over medium high heat. Add remaining 1 tablespoon sesame oil. Add the ginger and garlic, cook about 30 seconds and then toss in the carrots, mung bean sprouts and mushrooms. Cook for 3-4 minutes or until the veggies are tender crisp. Add the noodles and toss well until combined with the veggies and warm through, about 1-2 minutes. Remove from the heat and add in the sauce from the glass measuring cup or bowl, toss well. Add the basil, green onions and peanuts, toss again. Serve warm or at room temperature (I like this best warm!! ), topped with toasted sesame seeds, hot chili oil and hot red chilies. Happy Chinese New Year!!! Eat some good Chinese food tonight. It’s a must! Chocolate Covered Toasted Sesame Fortune Cookies. Um, why is everything about this post 100% something I deal with too!! I swear I’m in a perpetual state of needing more eggs and butter–or maybe that’s just a statement about what kind of cooking I do. Will stop for ingredients later…..a hot day in Johannesburg….but a good dish to end a busy work day. Thank you. Hope you love them!! THANKS! 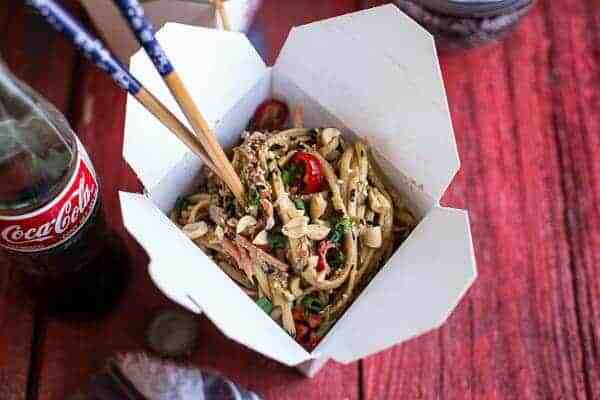 Woow.. these sesame basil noodles look so delicious! Happy Chinese New Year! Thanks Mary! Happy Chinese New Year!! 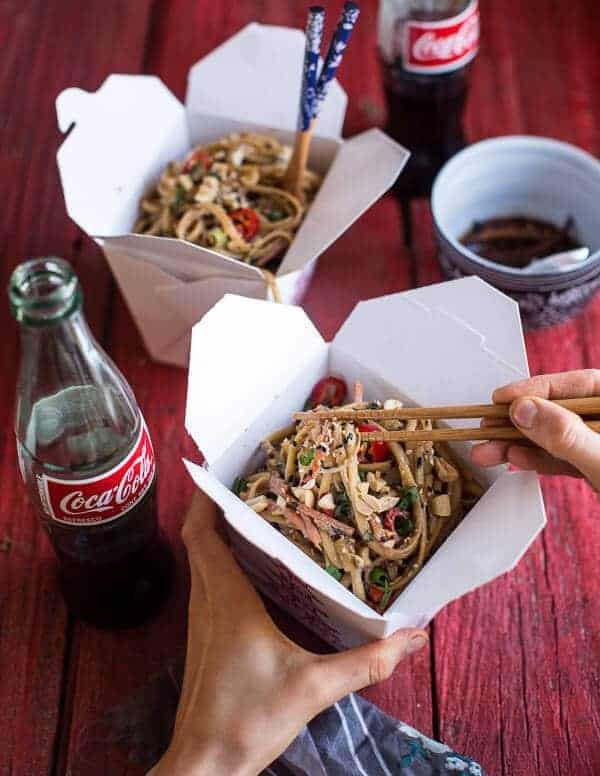 Love the noodle recipe and everything goes better with coke. On my 11 mile drive to work I pass 5 super size grocery stories which I have to make pit stops at during the week because I always forget something or I need more fruit–ugh. Thanks so much for your nice recipe. Love the nuts and sesame seeds addition. I am also a snob when it comes to food. Hey, nothing wrong with wanting the best for our bellies, am I right????? This looks amazing. And I have a really bad habit of going to the grocery store like 4 times a week. I should really be more organized. But it’s hard. And when you run out of chocolate, you gotta make that extra trip to re-stock! 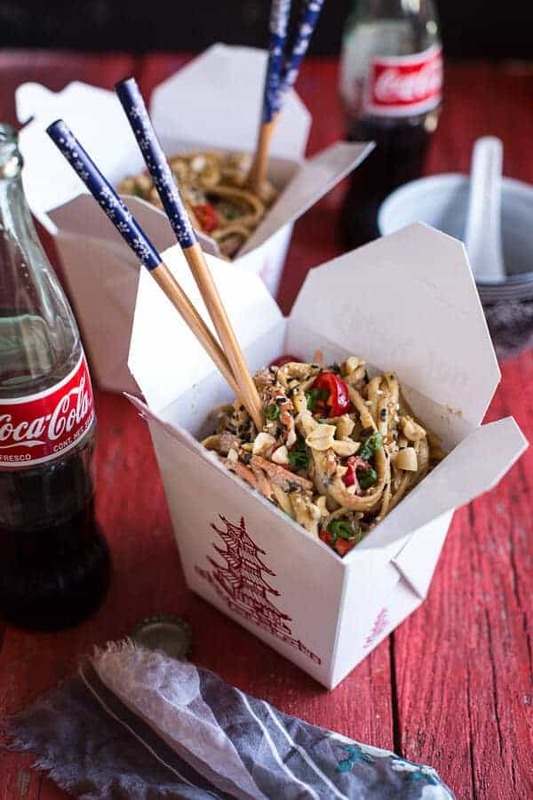 I am big on noodles, and these look so yummy! I would have them for breakfast! Thanks Suzy!! Have a great weekend! I’m with you, Tieghan. The first line of a post IS always the hardest! But do you know what isn’t difficult? My decision to make these noodles STAT! Seriously, I don’t know how you make incredible food day after day, but I love it! Gorgeous photos, as always! Thank you so much! Hoping you are having a great Friday! They know me by name at my grocery store, sort of embarassing… But I started keeping my grocery list on my phone because I was always forgetting things! I am pretty sure that a walk in pantry with all the fresh produce, dairy. cheese and chocolate would be a dream come true. Can we start finding a sponsor for that?! Wow! This looks fantastic Tieghan. I will be making this very soon that’s for sure! I think I have most ingredients too! haha, totally agree – the first line of a blog post always gives me pause…I like yours! And I like these noodles. A big bowl like this is so satisfying! Hey there. This looks amazing. I’m wondering though, do you think I could substitute the brown sugar for honey? I’m thoroughly enjoying your stunning blog posts. You make some of the most beautiful food I’ve ever seen. Thanks for that. Hi Teresa!! Yes, I think honey will be great!! Thanks for the kind words and enjoy the noodles!! Totally worth the extra effort of finding the boxes! The picture totally drew me in with those tempting white and red guys. I really can’t wait to make this. 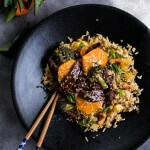 I’ve been really into making healthy asian food at home lately and this looks like a good recipe to add! I’ve been loving all the awesome Chinese this week, Tieghan! So sad that it’s over but knowing you that won’t be for long. It sounds like you were really determined to get these boxes and they look perfect in the shots. 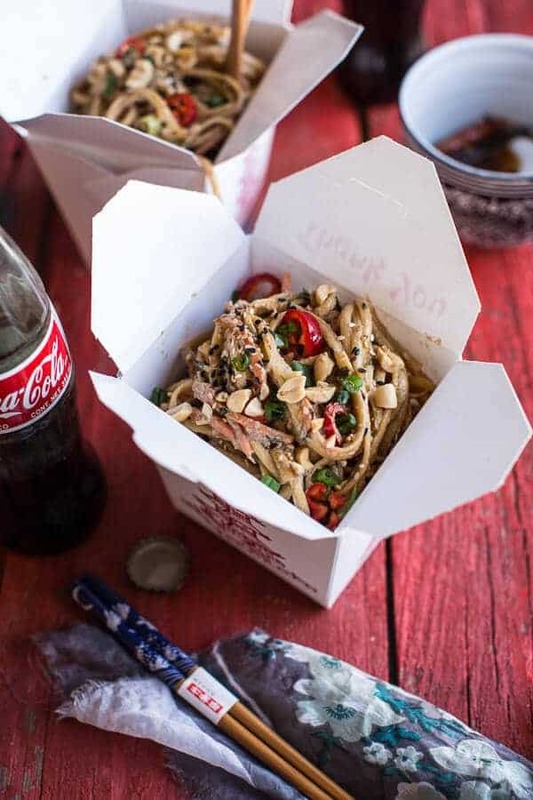 It totally finishes the package and show s off how incredible these noodles are! Thanks Tori! Have a great weekend!! Ditto on the obsession with visiting the grocery store! I have a problem. And then, I am always like “oh, I just need a basket”……lies. I need a semi truck to carry all my stuff out. Oh well, at least we are admitting we have a problem! First of all, I could not relate more to your first sentence more if I tried, haha! Oh gosh, if only I could tally up the amount of hours (maybe days?) I’ve sat in from on my computer screen, re-writing the first line of my post 700x, and ultimately accomplishing nothing for the vast majority of the time! And I also agree on the grocery store front. Luckily we have Amazon Fresh in Seattle, so I can just order all of my groceries online and have them delivered. As much as I like *going* to the store, sometimes it’s just so much easier to make sure I get everything I need by reading that everything is in the cart haha! WHOA! Amazon fresh?!? That is amazing! I would abuse it! They look amazing! I love the food styling here (and the Coke bottle!). Makes me think I’m at a chinese restaurant in NYC! Thank you so much!! Hope you have a great weekend!! Grocery store as a pantry = YES! I would love that, just as much as I love these noodles! Same here…but I hate when it does not get easier. UGH! I feel that way with butter and eggs! I buy a cartoon one day and then I need another cartoon within 2 days. I`m like, can people deliver eggs and butter to me weekly, please? Free shipping, too. Thanksss. Anyways, these noodles look awesome!! 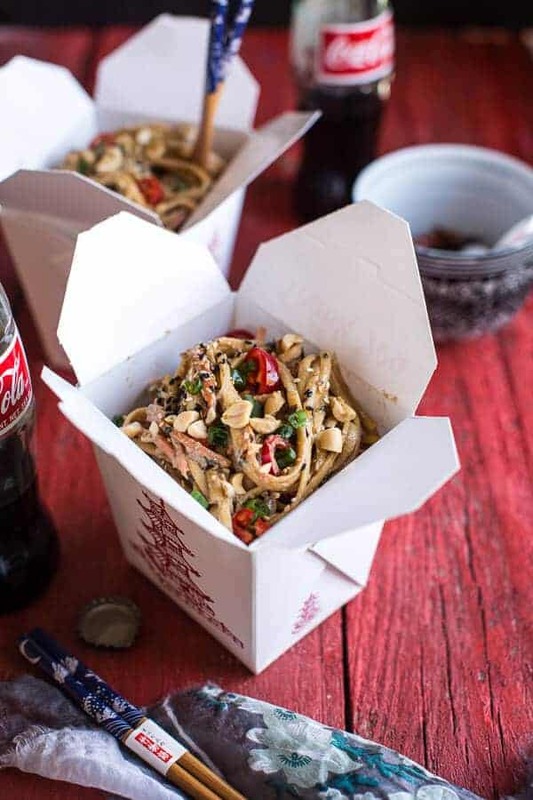 As a Chinese American, noodles are always a good dish to eat! Love the styling on this post! As for the chocolate, my problem used to be I was getting through so many tiny bags of it from the grocery store, until Izy at Top With Cinnamon introduced me to the joys of buying it wholesale! 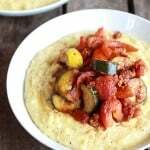 Why do I see pieces of red bell pepper in the picture but not the recipe? Those are actually just red fresno peppers. I only used them for garnish, but feel free to add bell peppers if you wish! Great recipe and I think I’ll finally need to get some Tahini to recreate this yummy treat. I only just fell in love with the taste sesamin oil and have been using it extensively in asian inspired dishes or my favorite chinese cucumber salad. That is sooo true! The first line is always a stumper. Everything you make looks like gold and your photography is gorgeous! I feel like I always learn something from your posts and they leave me drooling! This is on my grocery list! I love this! 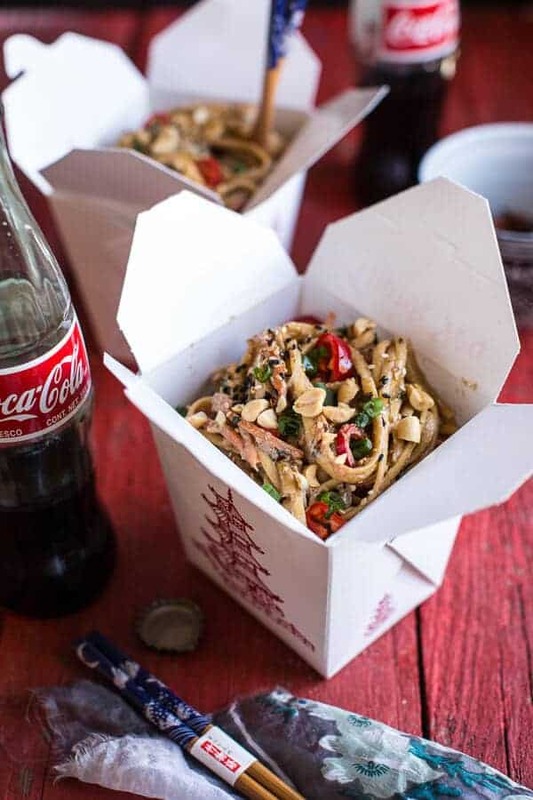 And those take out boxes are the coolest! 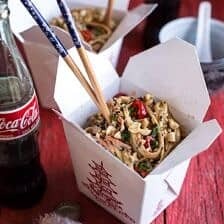 I made these noodles last night and my husband LOVED them! Such great ingredients that make them stand apart from other sesame noodles. They reheat well too! Thank you!